All summer long, you've been asking your Mom for a pet. She keeps saying "no," and you totally understand why. She thinks she'll end up taking care of it and feeding it. She says she'll have to clean up after it because she thinks you won't. What she doesn't know is that the pet you want never has to be walked. It doesn't eat very often, its food isn't expensive, and there's very little clean-up involved. The pet you're thinking about is different, so you'll want to learn about it before you get one. And by reading "Awesome Snake Science!" by Cindy Blobaum, you'll school yourself enough to be able to teach Mom, too. The first question, though, is: where do you live? Unless your house is in Ireland, New Zealand, or Greenland, on the North or South Pole, or atop Denali or Everest, there's probably already a snake nearby. Cool, huh? So now that you've decided to become a herpetologist (who studies amphibians and reptiles) or an ophiologist (who studies snakes, specifically), you'll need to know that you'll be busy: there are around 3,000 kinds of snakes in the world and each kind has adapted to its surroundings. Some snakes are tiny, like the less-than-4-inch-long thread snake. Some, like the Anaconda, can weigh up to 500 pounds! Some are common (like corn snakes), while the Antiguan racer is so rare that scientists only recently rediscovered it. "All snakes have teeth," says Blobaum, but the fangs are the ones that make a snake kind of famous. Fangs look dangerous — and they definitely can be — but they're also necessary because, without them, a snake couldn't eat. Fangs help the snake catch and hold prey, his gape (open mouth) determines how he swallows it, and his sharp teeth pull the meal toward his throat. Snake venom (which come from the fangs) isn't always poisonous, by the way some venom is used as medicine. As for the snake's skin, it's also pretty cool. Snake skin stretches to make room for lunch. It's waterproof, overlapping protection for the critter. And the scaly colors on a snake's body can be used as camouflage, warning or lures for prey — which really ain't nothing to hissss at! So you say your child is interested in things of a slithery sort? That won't rattle either of you when you've got "Awesome Snake Science!" in your house. 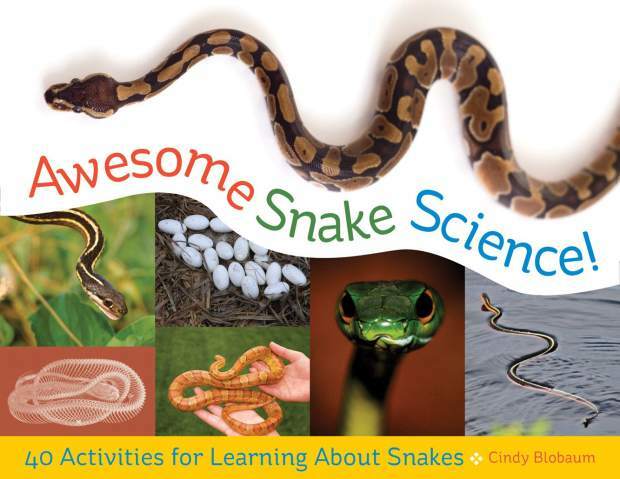 From colorful to camouflaged, pets to poison, author Cindy Blobaum gives kids a "good foundation of basic knowledge about snakes" so they can become mini-experts on the reptiles. Readers on the younger side will appreciate step-by-step activities, which help understand snake anatomy and behavior, while older kids will like the tips and trivia, as well as the solid information included here. Kids of all ages will appreciate that there are pictures in this book but, alas, they're not in color.